Much like the recent swathe of X99 motherboard previews we have seen, memory manufacturers are getting on board with showcasing their DDR4 memory modules to use with the Haswell-E platform. Unlike the CPUs from Intel, there is no formal NDA as such, allowing the media to report the design and specifications, although because real-world performance requires the CPU, no-one is able to post benchmark numbers. The new DDR4 from G.Skill is the next DRAM module manufacturer to come out with an official press release, and following the previous high performance Ripjaws DDR3 range G.Skill will introduce its memory under the Ripjaws 4 moniker with a new heatspreader design. G.Skill’s press release confirms the voltage ranges for DDR4, with 1.2 volts being standard on 2133 MHz to 2800 MHz kits, with the higher performance modules at ≥3000 MHz and above requiring 1.35V. The product line that G.Skill is aiming to release at launch is quite impressive with all the 1.2 volt modules in 16GB, 32GB and 64 GB kits. Due to the extra binning and higher tolerances of the more performance oriented kits, the DDR4-3000 C15 will be in 16GB or 32GB kits, DDR4-3000 C16 will be in a kit 32GB and the top line 3200 MHz C16 will be in a 16GB kit only. G.Skill is reporting full XMP 2.0 support, and that this new module design matches the 40mm height of previous Ripjaws designs, allowing previous CPU coolers to be matched with this generation. 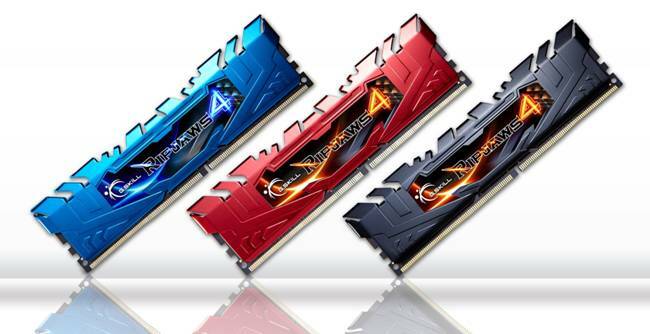 As the modules are launched, the three colors G.Skill is pursuing are blue, red and black. I know G.Skill monitors our news, so if you really want another color in there, make a note in the comments. Every PC in my house has GSkill RAM. When I upgraged from 4GB to 8 at work, it's GSkill. I've got another 8GB Sniper kit coming Monday. DDR3 1600 CL9 had an effective latency of 11.25ns. DDR4 3000 CL15 is at 10ns. Once upon a time we had DDR-3200 GB/s. Once upon a time we had sound waves traveling down tubes of mercury. How things have advanced.